As Wellesley’s own Reunion concluded, a mini-reunion of another kind aired on ABC News on June 9. Distinguished journalist Diane Sawyer ’67 interviewed former U.S. Senator and Secretary of State Hillary Rodham Clinton ’69 in the first prime-time special dedicated to Clinton’s new memoir, Hard Choices. During the interview, they discussed their times at Wellesley, Clinton’s role in leading American foreign policy, and the possibility of her presidential run in 2016. "Nothing was off the table," as Sawyer introduced it. The two alumnae overlapped during their Wellesley years. Originally from Kentucky, Sawyer majored in English, was a member of the Wellesley College Blue Notes and Phi Sigma lecture society; from Missouri, Clinton (then Hillary Rodham) majored in political science, led fellow students in advocating for more student involvement in campus decisions, and delivered Wellesley’s first-ever student commencement speech. Sawyer worked in the White House press office in the 1970s, and became the first woman correspondent and co-anchor on CBS news programs and later moved to ABC, where she now anchors ABC World News. Clinton’s career took her from Yale Law School to Arkansas and then the White House as First Lady; the Senate as a New York senator; and eventually the State Department as its leader. Both alumnae returned to the College to give commencement addresses, with Sawyer speaking in 1986 and then-First Lady of Arkansas Clinton in 1992. 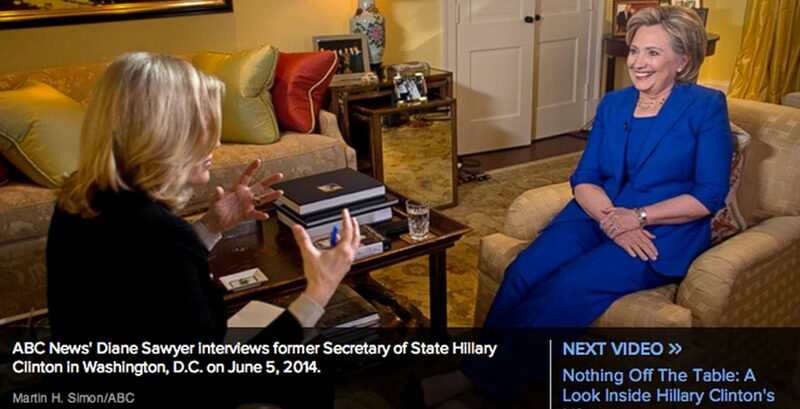 In the interview, Sawyer and Clinton discussed the “hard choices” of the book’s title, including a choice that the latter will make over an upcoming presidential run. Watch segments from the ABC special on ABCNews.com.